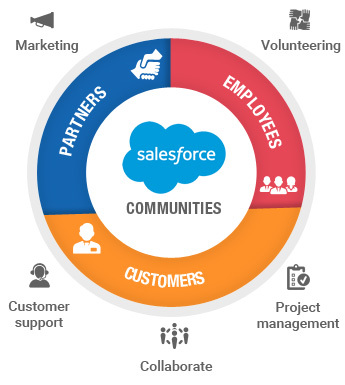 Salesforce Communities are branded online communities in Salesforce, where employees, customers, and partners can easily connect and collaborate. Communities are customizable, include strong performance tools, and can be geared towards anything, including marketing, volunteering, customer support, and project management. This communication software offers many benefits for user engagement, and overall lends advantages to several key areas of business. Once your online community is up and running, you can instantly monitor use through the engagement matrix on a community dashboard. This dashboard also allows management to add new content, run contests, award users with badges, and partake in direct discussion with customers. Furthermore, with the introduction of chatter into a Salesforce community, users can post comments, collaborate by hosting contextual discussions on specific records, create public and private groups, and discuss trending topics. Utilizing Salesforce Communities aids in bringing together similarly focused users. Whether creating a company community or a customer support community, Salesforce offers the tools needed for seamless communication between users. With the ability to create separate, focused communities, management can keep content organized while partaking in seamless communication and collaboration. Call us at 484-892-5713 today to learn more about Saleforce Communties, and how using Salesforce can unleash your business potential.